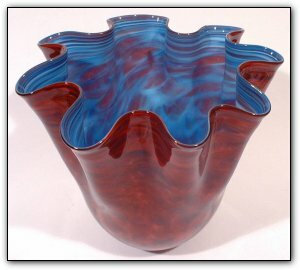 The inside of this fluted bowl is a mix of blue and white, with a little bit of the burgundy showing through. The outside came out spectacular. Gold color was applied and then a bright pink on top of the gold produced a very rich looking burgundy sparkle. Because of its shape, it also lays very nice on its side.